I've been doing this CRAZY thing where I stamp just for the fun of stamping. I know, outrageous right? 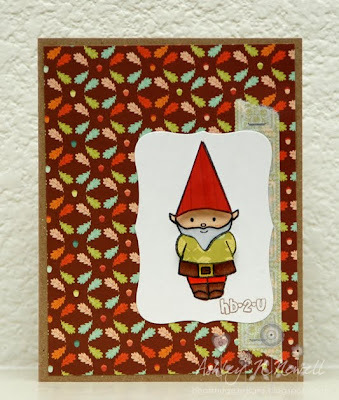 Here's a card I made with my very favorite Wilson Designs Stamps set, Gnomebody Like You. I used my pal Tiff's sketch that you can find HERE. I combined coloring with paper piecing. A nice balance when you don't want to spend all day coloring. Have a fabulous day everyone! Ohhhh and did you see this: There’s a new challenge blog in town with articles, swaps, interviews, videos, challenges, great prizes and MORE! Check out Lily Pad Cards! So so so cute Miss Ashley!!! Thanks for using Wilson Designs Stamps....yay!! !